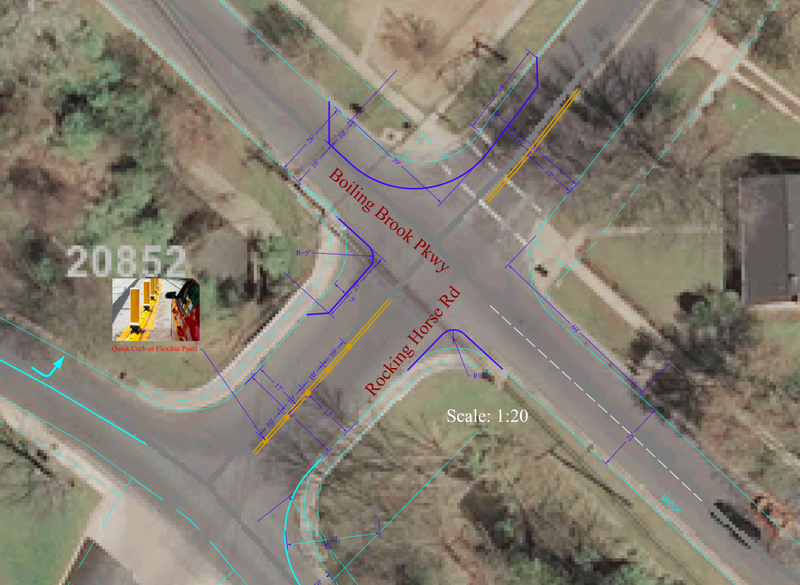 A long standing issue in our community is the daily frustration many of us feel as we try to navigate the Boiling Brook Parkway / Rocking Horse Road intersection. Several RCA board members spent a cold December morning monitoring traffic at the intersection with a member from the Montgomery County Department of Transportation. It is clear that the intersection has issues. Unfortunately, given the location of the intersection with the creek, our options are somewhat limited. Below you can see the changes that DOT has proposed. Click through for a larger version. The changes are aimed at calming the traffic in the intersection and limiting some of the motions, which will hopefully make for a more orderly intersection. Any changes would be marked temporarily to gain feedback prior to permanent changes being made. Please share your feedback privately with me chad@randolphcivic.org or with the community on our Yahoo Group.